I was lucky enough to photograph a graduating 5th grade class earlier this spring. You could feel the excitement in the air as the kids had made their choices about schools they would be moving on to for 6th grade. What an incredible time to get to document! This is just one of the amazing kids that I met - I could have spent the entire morning photographing this sweet beauty! I can't wait to meet next year's students this fall! It's SPRING!! The light is absolutely magical at the end of the day! 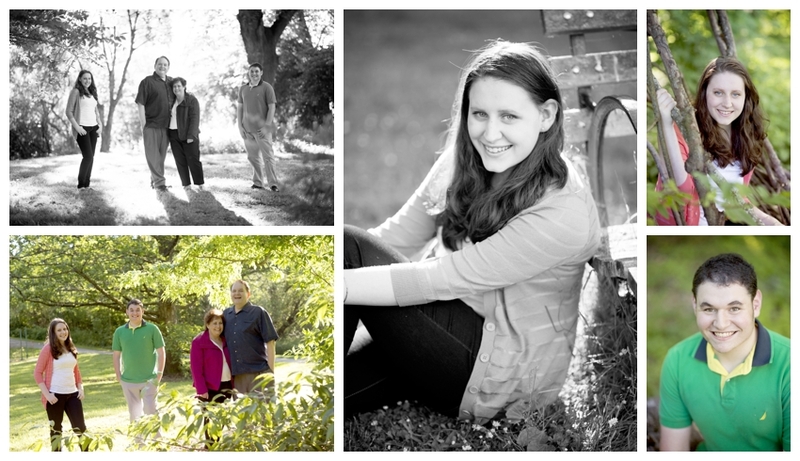 I'm offering Spring Mini Sessions on Wednesday evenings through the end of June. All sessions will be held at the Mercer Slough (exact location will be given upon booking). The fee of $495 plus tax includes the 30 minute session plus a set of 10 digital files. $195 due to hold your session, the remaining $300 due the day of. 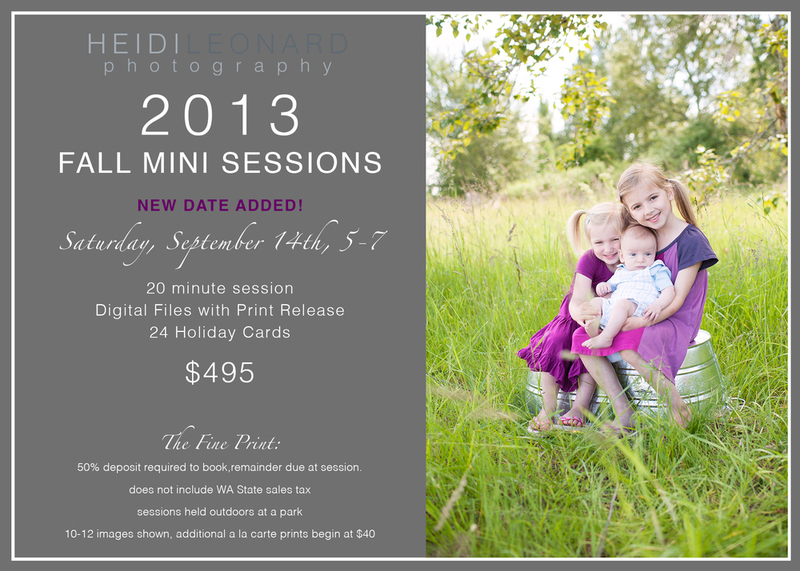 E-mail Heidi@heidileonardphotography.com to book! I absolutely love school portrait day! This happened in the blink of an eye!! Thank you!!!!! What an amazing year it's been!! I'm so grateful to all of you for making my last year so incredible. As my gift to you, I am offering a special 2014 New Year Digital Collection through the end of the weekend! I am offering a one hour session plus a set of full resolution digital negatives for $950 (regularly $1695). Hurry! Only 5 collections available! Session must be paid in full by Sunday, January 5th! Family Photo for the Holiday Card! Just need that one perfect family photo for your holiday card? Join me on November 16th!! E-mail heidi@heidileonardphotography.com to book your spot! We had so much fun running around the park for this family's session! These kids were a blast! I think my favorite images were of the family cuddled together while their oldest read their youngest a book. I love the look on his face as he listens to his sister read to him. This session was so much fun! We attempted to have their gorgeous black lab join us for the entire session, but he had other plans. It was a lot of fun to wander the park and get to know this amazing family. It was hard to narrow down my favorites! Do your kids have their Halloween costumes all set? Stop by my house for costume photos! E-mail heidi@heidileonardphotography.com if you need the address. These kids were an absolute blast to photograph! At the end of the session, the boys headed into the very cold water! Those ended up being my favorite images from the session. I met this family on the dock as they came in on a sailboat!! SO MUCH FUN! I loved getting to spend the morning with this amazing family. So many gorgeous images, I couldn't narrow it down! 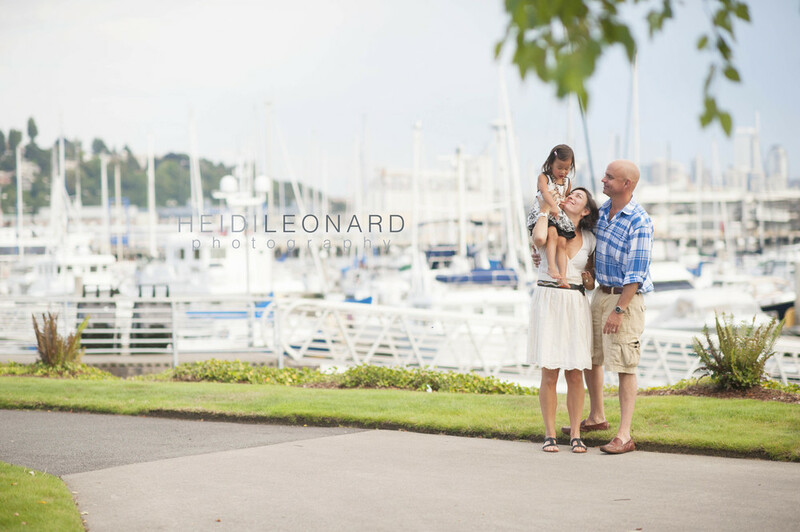 I couldn't resist a sneak peek from a wonderful session on Elliott Bay earlier tonight. I met this awesome Kirkland family a couple of weeks ago. Their sweet daughter had just started walking!! Here's a little sneak peek for this afternoon. I can't wait to show this family the rest of their images! one additional day of holiday mini sessions has been added with evening sessions only! What I love about photographing the littlest ones is getting parents in the photos. As kids get older, parents are often less willing to get in front of the camera. However, when the little ones are still tiny, it's absolutely magical to get to photograph the connection between parents and their babies. This is just half of this sweet family of 4. I was lucky enough to photograph this family of 4 about a month ago. We met at the Arboretum (note to self: check 520 closures ahead of time!) one absolutely gorgeous evening. I met Mom years ago when we lived on the same street when I was a baby!